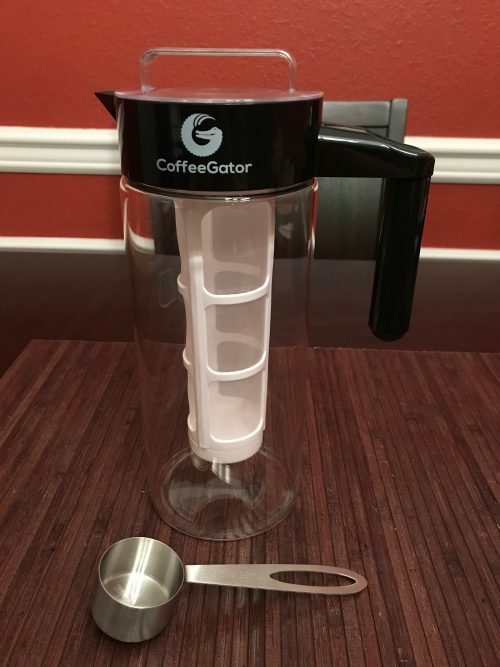 In addition to their Vacuum Insulated French Press, the folks at Coffee Gator also sent me a package with their Cold-Brew Coffee Maker Kit to try. I make cold-brew coffee a couple of times a month (mostly for Shutterbug), but I don’t use a dedicated device for it, so I was very curious about how using this would fare compared to my normal method. Grind 127 grams of coffee coarsely and place in the glass carafe. Add filtered water until the mixture is about 1/2 inch from the top of the carafe (about 825 grams of water). Stir the grounds into the water until all the grounds are completely saturated. Cover with plastic wrap and let sit at room temperature for 24 hours (+ or – a few hours is okay). Plunge and strain the liquid through bleached paper coffee filters sitting in fine mesh strainers to remove any silt. Store in glass containers. Enjoy over ice with additional water or milk to dilute the concentrate at a 1:1 ratio. This is an easy method that doesn’t require any special equipment (it allows the french press to be a multi-tasker!). It does, however, require straining after the coffee has been sitting in order for the final product to be free of any sludge, which can be a bit of an annoyance. When you’ve already been waiting for 24 hours, having to wait an additional 15 minutes or so for the coffee to drain through the filters seems like ages! 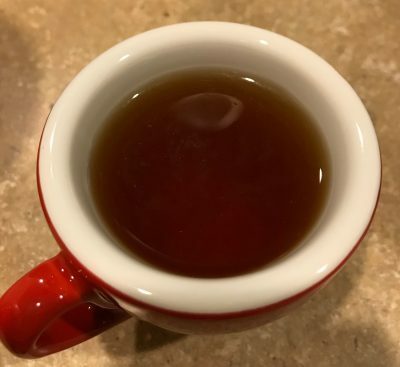 However, I’ve been very pleased with the results from this method; it produces a robust, thick, opaque cold brew and the coffee flavor stands up really well when cut with other things (I’ll typically add around 4-6 oz. of almond milk for every 4 oz. of cold brew and it tastes great). I’m not big on iced coffee (I tend to drink it WAY too fast and I get loopy from the quick influx of caffeine), but if I do choose to have it, I dislike how adding ice to regular coffee creates a watered-down flavor. Cold brew is a great way to avoid that problem. It’s also a fantastic way to use up quality coffee beans that are more than a few weeks old! Cold-brew makers seem like a great way around the inconvenience of having to strain the concentrate, as there is a fine mesh filter built into the device. 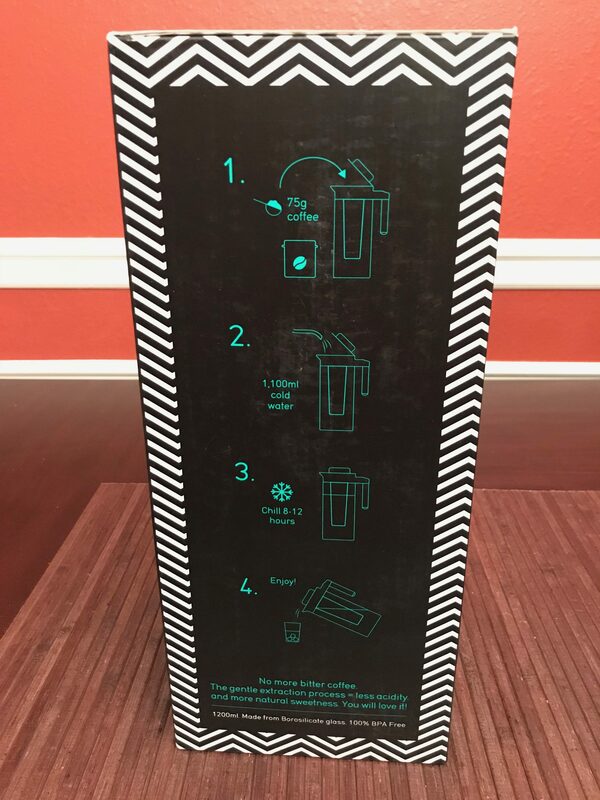 The device from Coffee Gator has a large, high-quality glass carafe that comes with a plastic top and handle with the mesh filter built in, with a plastic lid for the top. 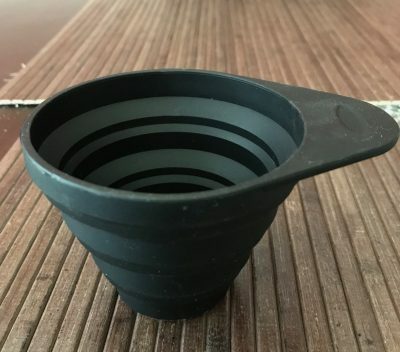 The company also provides a handy measuring scoop and a collapsible rubber funnel. Given that the ratio of coffee : water that I use is 127 g : 825 g, much higher in coffee than the suggested 75 g : 1100 g, I was skeptical that Coffee Gator’s instructions would result in the flavor I wanted, but I decided to follow the package instructions exactly to start. I followed the instructions to the letter, even placing the carafe in the refrigerator for the suggested 8-12 hours. 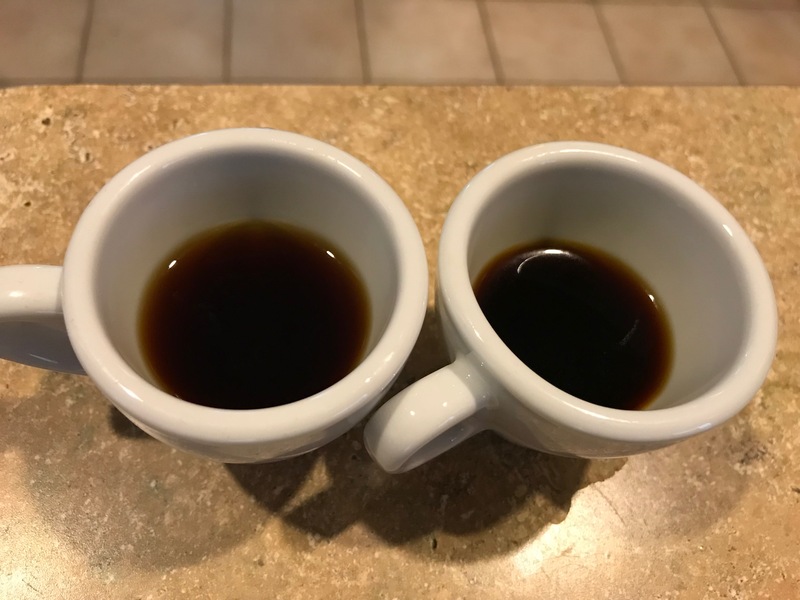 After 12 hours, I poured a bit of the Coffee Gator cold brew and a bit of my already made “normal” cold brew into espresso cups to observe the difference. Left: Coffee Gator; Right: French press method. 12 hours in the fridge in the Coffee Gator cold-brew maker resulted in a cold brew that looked and tasted like tea. This was hugely disappointing when I was hoping for a result more like the cup on the right. I want my cold brew to look more like motor oil! Better, but still a long way to go. Next, I decided to try making cold brew in the Coffee Gator device but according to MY parameters and instincts. One problem though was that the cold-brew maker was only designed to fit 75 grams of coffee at a time, far short of the 127 grams I like to use, so I adjusted the ratio to 75 g : 510 g coffee to water. This also appeared to be a problem, in that the smaller amount of water only reached less than halfway up the sides of the glass carafe. Other than the initial pour of water into the vessel, there were large sections of grounds that were not in contact with water! Nevertheless, I decided to let this sit for 24 hours at room temperature to see what would happen. Left: Coffee Gator cold brew brewed at 75 g : 510 g ratio; Right: my French press cold brew. Better! 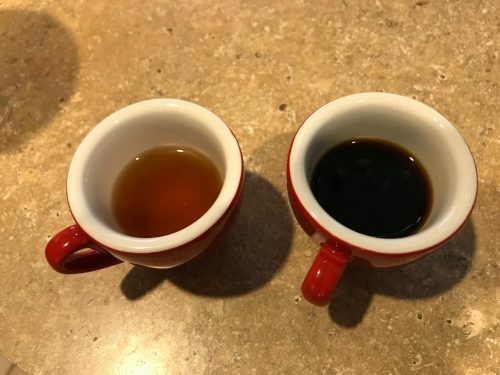 You can see that the cold brew on the left is slightly less dark and saturated than the cold brew on the right, which looks deeper in color and glossier. I tasted both shots and the flavor difference was actually pretty pronounced. The coffee I had been using for the cold brew batches was a blend of all African beans (a mix of Ethiopian and Kenyan). The Coffee Gator batch had a remarkably bright berry flavor, while the French press method tasted much more chocolaty and deeper in flavor. I liked both! 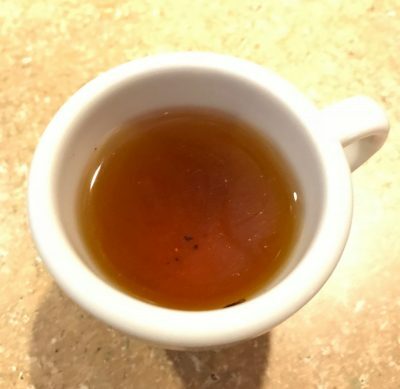 My guess is that because the Coffee Gator beans were exposed to less water, it extracted a smaller proportion of the flavor of the beans, resulting in more “high” notes as opposed to the mellower “low” notes of the other method, where all the beans had contact with the water. The photo is a bit overexposed, but you can tell that the cold brew is not nearly as dark as I think it ought to be, given that you can see the bit of coffee grounds in the bottom of the espresso cup. This didn’t taste anything like coffee, either. I let the coffee sit for a full 72 hours in the Coffee Gator in hopes that it would get better over time, but… it didn’t. I couldn’t drink this. The one big benefit of the Coffee Gator cold-brew maker is that I didn’t have to run the coffee concentrate through a mesh filter before serving to remove grit; I could pour the cold brew directly over ice and serve. However, unless I was using WAY less water than the company called for, I felt the final product looked and tasted weak and diluted, which is the opposite of what you want in a cold brew. When I brewed at a 75 g : 510 g ratio, the cold brew this device produced tasted quite good, but certainly different than when you brew in a method where water is able to saturate all the grounds evenly, and it felt like a waste that I couldn’t fill the carafe up to the top. If I am going to wait 24 hours for cold brew, I want to make as much as I can at one time without sacrificing quality. If the mesh filter column was larger, perhaps that would remedy my issues with this device. Summary: Great in theory, but if you’re like me and want a decadently rich and deeply-flavored cold brew, this device may not be for you, despite its convenience. However, if you prefer a lighter-flavored cold brew and don’t want the hassle of straining your concentrate after brewing, this is a good option.